Unicorns seem to be everywhere I look these days! I found the cutest unicorn counters and erasers in my favorite spot...the Target Dollar Spot! I just knew the counters and erasers would be perfect for a math game. 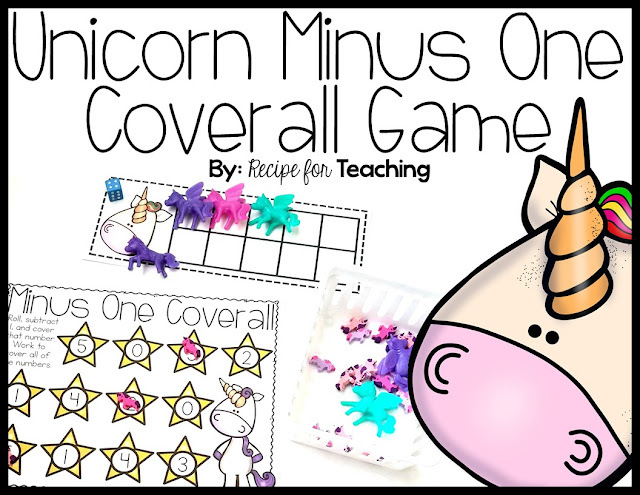 This Unicorn Minus One Coverall Game is a great way to practice subtraction skills with young learners. 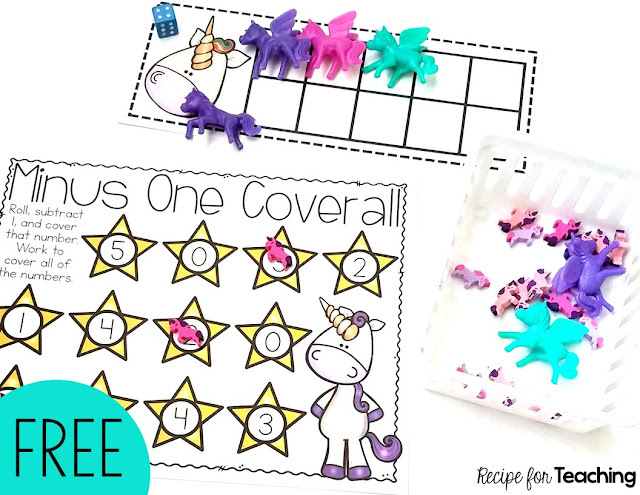 The unicorn counters and erasers are perfect to use as manipulatives for this subtraction math game. This game was easy to prepare! I first printed the game board and the ten frame on white cardstock for durability. The ten frames come two to a page, so I used my paper cutter to cut out the ten frame. There is also a black and white copy included in the download (found below) that could be printed on colorful paper. I then ran the game board through my laminator. I also grabbed a basket of unicorn counters and unicorn erasers, as well as a dot cube. My students were so excited when they saw we would be playing a math game with unicorns! For this game, I had my students roll the dot cube. They used the unicorn counters to count out that many unicorns on their unicorn ten frame. Since this is a minus one game, they then took away one unicorn from the ten frame. Some of my students were able to determine one less without counting the leftover unicorn counters and some counted the leftover unicorns. I like to hold my students accountable for their math work by having them say the subtraction equation to the partner they are working with. For example, in the picture below, they rolled a 6 and took away 1. They would tell their friend, "6-1=5." After students determined what "minus one" was, they covered that number on their game board with a unicorn eraser. Students continued this process on each partner's turn. The goal of the game is to cover all of the numbers on the game board. After students have learned this game and are familiar with it, this game would make a great addition to a math station. 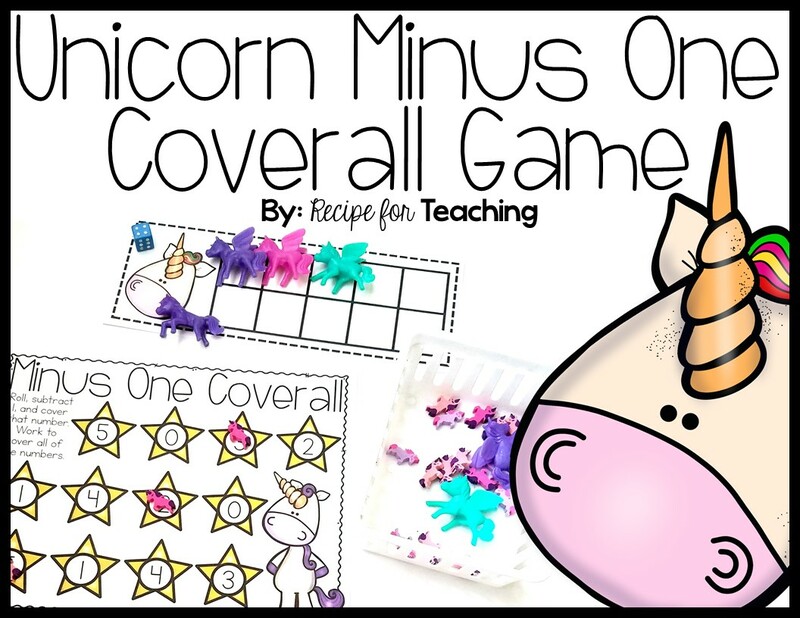 Looking for some ways to differentiate the game: *Have students record the minus one equation on a dry erase board or in a math notebook *Have students draw a picture to represent the unicorn minus one subtraction Ready for some Unicorn Minus One Coverall Game FUN?!?! Just click the image below to grab your FREE copy of the game! 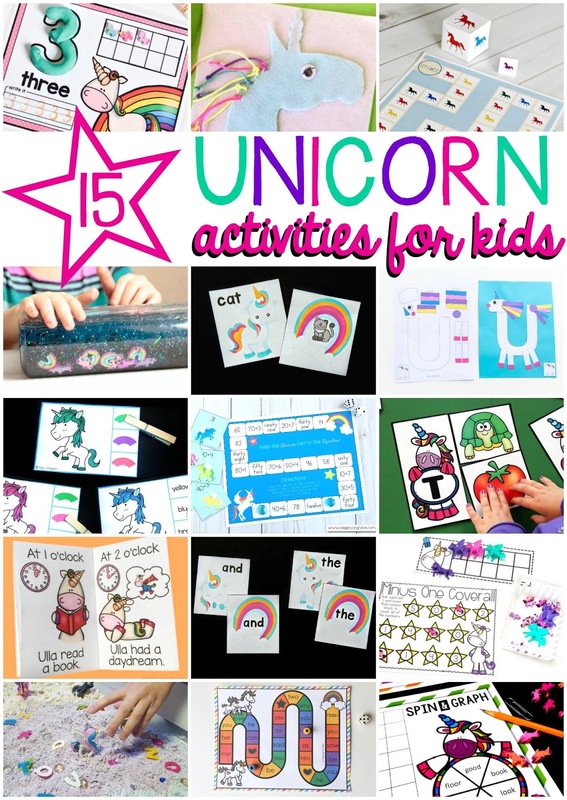 Be sure to check out some other fantastic unicorn themed activities from these amazing bloggers!